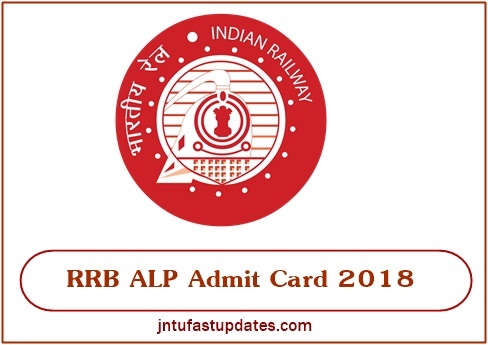 RRB ALP Admit Card/ Call Letter Download : Railway Recruitment Board (RRB) has released the admit cards for Assistant Loco Pilot (ALP) and Technician Grade 3 posts. Aspirants those have applied for the RRB ALP Technician posts 2018 can download their corresponding admit cards from the RRB regional websites. Candidates will be having the RRB ALP Grade 3 Examination in April/May months 2018. Hence all the aspirants applied for the RRB Grade III examination can download admit card and take it to the examination centers without fail. Candidates will not be allowed to appear for the test without checking of hall ticket. The examination officers are going to check the admit cards before starting the examination. If at all, candidates forgot/lot the admit cards, they will not be allowed to appear for the test. Hence candidates must check twice whether they are carrying the admit card or not. Otherwise, they may lose the chance to attempt the examination. RRB Alp Admit Card 2018 : RRB is the national level recruitment board known as Railway Recruitment Board. Totally Railway Recruitment Board (RRB) has nearly 21 boards which work with it for selection of eligible candidates into various RRB departments for various parts of India. The sub-boards of the Indian Railway Recruitment Board include RRB Ahmedabad, RRB Bangalore, RRB Kolkata, RRB Ajmer, RRB Allahabad, RRB Bhubaneswar, RRB Bhopal, RRB Bilaspur, RRB Chennai, RRB Chandigarh, RRB Gorakhpur, RRB Guwahati, RRB Jammu and Kashmir, RRB Mumbai, RRB Malda, RRB Muzaffarpur, RRB Ranchi, RRB Secunderabad, RRB Patna, RRB Thiruvantha-Puram and RRB Siliguri. RRB Hall Ticket 2018 For ALP: Annually the RRB is going to offer a huge number of jobs for the aspirants. This year the RRB has released the 26502 ALP/Non-Technical Grade III posts. A huge number of aspirants seeking for the Railway jobs have applied for the RRB Loco Pilot Technician Grade III vacancies. The RRB is going to conduct the RRB Gr III Written test 2018 in April May months. Hence candidates appearing for the examination can download hall ticket before 15 days of the examination from the RRB official portal of their region. Candidates have to carry the valid identity proof like PAN Card, Aadhar Card, or any other proof along with the admit cards for verification purpose. Starting Date of ALP Exam has been announced. Complete Schedule of Exams date wise will be announced on july 26th and Exam city, date, sessions for first stage of cbt released on july 26th. Check From Below. Click on the link given above to check your Exam City/Date & Time for RRB ALP CBT. Now enter your User Password/DoB. You can now check your RRB ALP Exam Date. After downloading the admit cards, candidates can check the details of their examination center, date and time of the examination and other details from it. So, candidates are requested to download their RRB hall ticket for this exam with the help of procedure given below before 10 days of the exam and carry it to exam center along with other necessary documents as given in the instructions section of hall ticket or as mentioned in the notification. Stay here for RRB ALP Hall Ticket 2018 Download Option. we will keep update after announcement. How to Download RRB Assistant Loco Pilot (ALP) Exam Admit Card/ Hall Ticket 2018? In the home page of the official website, you can find Latest Updates tab. Click it. Now, you can check for RRB Admit Card 2018 link in that section and tap it. Give all details necessary for application number, date of birth and then click on submit button. Finally, you will get your respective hall ticket in the pdf format in the new tab. You can download the admit card on your drive and take print out of the RRB hall ticket for further taking it to the exam center. 1. Candidates are advised to note that no requests for change in examination centres would be addressed. Candidates are required to report to the examination centres allotted to them on their admit cards. 2. No admit cards would be sent to the emails of the candidates (as was earlier mentioned in CEN 01/2018). Candidates are required to download their admit cards from the respective regional RRBs. Please remember to download the admit cards only from the respective regional RRBs. 3. Admit Cards for RRB ALP & Technician Exam 2018 which is scheduled for August 9 would be released on August 5. For candidates whose examinations are scheduled for consecutive dates, the admit cards would be subsequently released 4 days ahead of the examination. For example, your RRB ALP & Technician First Stage CBT is scheduled for August 16, in that case the admit cards would be released on August 12, 2018. 4. Examination cities and travel passes (for eligible candidates) are already available on respective RRB websites. All the candidates are advised to check the same and accordingly make their travel plans. As many as 47 lakh candidates have reportedly applied for RRB ALP & Technician recruitment 2018. Of these, as per the notification released, about 40 lakh candidates have been allotted centres within 500 km. Special consideration has also been given to female and PwD candidates and they have been given centres within 200 kilometres. First Stage CBT of RRB Recruitment 2018 for ALP & Technician posts begins from August 9, 2018. RRB ALP KA ADMIT CARD KAB TAK AAYEGA. sir admit card kb tk aayega..